Move over Lara Croft, there’s a new action hero in town! When unseasonable weather hits the sunshine city of Brisbane, a freak typhoon terrorizes the citizens. It’s not just any typhoon though, it’s a snake typhoon! And the deadliest snakes in Australia, with venomous fangs are flying straight for Kez. Kez is the new girl in the office and she’s desperately fighting to prove herself, but what’s a girl to do when faced with a typhoon of snakes coming straight for her helicopter? These flying diabolical snakes will stop at nothing to kill their victims and Kez only has one option: Figure out how to stop a snake typhoon and save the world… or die trying! 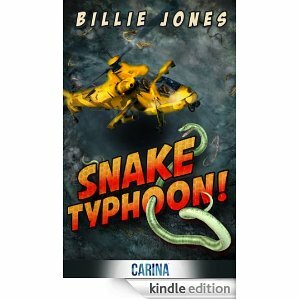 I expected an action adventure story along the lines of Shark – Nado but this is so much more! The author quickly pulls us into a hilarious situation and had me laughing from page one. The author has such a unique, witty way with words. 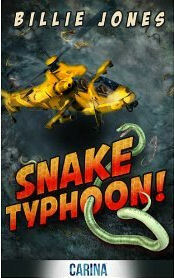 It’s a parody while the characters take the unfolding snake typhoon seriously. It’s hard not to get swept away with the drama while laughing at the unique situation. The ending was hilarious and I hope there is another instalment! 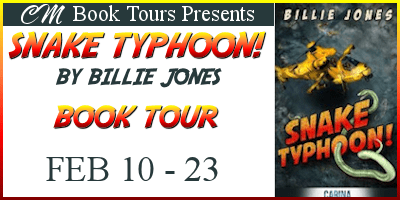 Billie Jones is a writer from Australia who enjoys imaging herself wrestling killer crocodiles and swimming with great white sharks. She thinks she may have to attempt base jumping so she can write about it and Bungee is on the list too. You can find her either in front of her computer writing about her fictional adventures or at the beach searching for the next perfect wave.